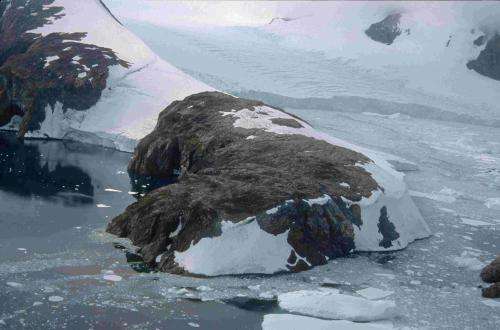 By carefully analyzing a 150-year-old moss bank on the Antarctic Peninsula, researchers reporting in Current Biology, a Cell Press publication, on August 29 describe an unprecedented rate of ecological change since the 1960s driven by warming temperatures. "Whilst moss and amoebae may not be the first organisms that come to mind when considering Antarctica, they are dominant components of the year-round terrestrial ecosystem in the small ice-free zones during an austral summer," says Jessica Royles of the British Antarctic Survey and the University of Cambridge. "We know from meteorological measurements and from the interpretation of signals preserved within ice and sediment cores that the climate of the Antarctic Peninsula has undergone substantial and rapid change. Our evidence, from the southernmost known moss bank, exploits an unusual biological archive and shows that the flora and fauna of the Antarctic Peninsula are very sensitive and have in the past responded, and continue to respond, to these changes in climate." The researchers looked to the Antarctic Peninsula because it is one of the most rapidly warming regions on Earth; annual temperatures there have increased by up to 0.56°C per decade since the 1950s. There they found a moss bank that has been slowly growing at the top surface and accumulating peat material since it first established in about 1860. 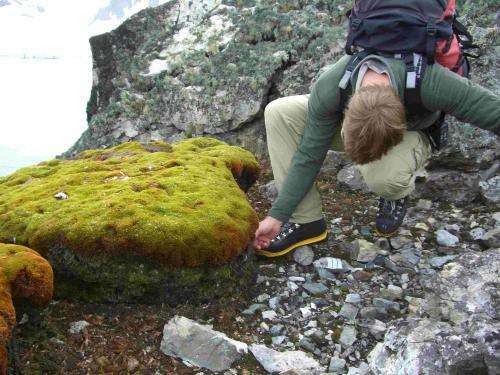 By analyzing core samples of that moss bank, Royles, Matthew Amesbury of the University of Exeter, and their colleagues were able to characterize the growth and activity of the moss and microbes over time. The researchers show that growth rates and microbial productivity have risen rapidly since the 1960s—in a manner that is unprecedented in the last 150 years—consistent with climate change, although recently it may have stalled. They add that future changes in terrestrial biota are likely to track projected temperature increases closely, and to fundamentally change the ecology and appearance of the Antarctic Peninsula. "The synchronicity of the changes between the various independent measurements made us confident that we were observing a real, important effect, consistent with projections made for polar regions," Amesbury says. "The rapid increase in the amoebal growth rate showed that higher temperatures, and perhaps altered precipitation, have had an impact on an entire microbial community." The researchers say the findings emphasize the importance of the monitoring work being done by the British Antarctic Survey. They will now sample moss banks along the length of the western Antarctic Peninsula in an effort to expand their historical record of climate and ecological change over space and time.